Well you can’t get a whole lot rarer than this: the seller claims only four of these were imported in 1980! 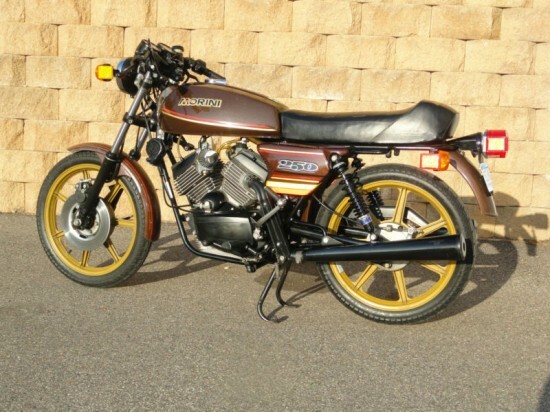 If you’re not familiar with Moto Morini, that’s no surprise. They’re been largely forgotten, since their big, booming recent offerings never made it across the Atlantic and their smallish 70’s and 80’s V-twins never made much of a splash over here in the land of “more is better”. But in Europe, Morini is famous for their stylish, sporty machines. Generally known for their “3½”, a 344cc 72° twin that sounded terrific, but made pretty modest power. It featured cutting-edge design, including a six-speed transmission, belt-driven overhead cams, and “Heron” heads that provided ease of manufacture and excellent fuel economy. While the bikes possessed excellent handling characteristics, their small displacement doomed them to obscurity here in the US. 6216 miles with a full 30 year documented history-dealer to my garage. This bike is one of the least great examples of hand made Italian craftmanship, especially in a small displacement bike. 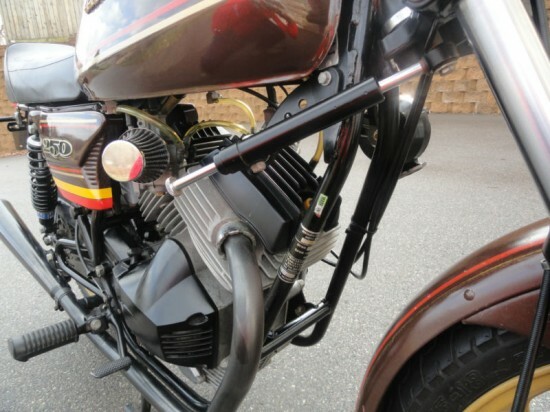 This bike was originally imported by Morini/BMW dealer Perry Bushong of Fort Worth TX. If you care to just google his name and or go to his shop, the guys a legend. Perry purchased this bike for himself new and told me that in 1980 it was 1 of only 4 of these models imported to the US that year. Perry kept it for quite a few years then sold it to his head mechanic. A few years back unfortunately his mechanic passed away and Perry sold it to a local collector, who in return sold it to me a few years later. New tires, new plugs, rebuilt carbs, replaced cracked speedo/tach housing with NOS one, replaced cracked pulse coil with new improved North Leciester Morini one, new battery, new Hagon rear shocks. This bike is a hand made tart, full Italian quality. Lafranconi pipes, Grimeca brakes/wheels, Veglia speedo/tach, Paioli front shocks and triple tree as well as a steering stabilizer, Verlichi fork boots and dust covers, adjustable low cafe bars, 6 volt system powers flashers and headlight. Everything on this bike works as it should and it starts first or second kick. No electric start. Mechanically I would say this bike is better than stock, the KN pods and jetting were done by Perry Bushong and he purchased the pods from Herdan motorcycles in Pennsylvania another former Morini dealer. 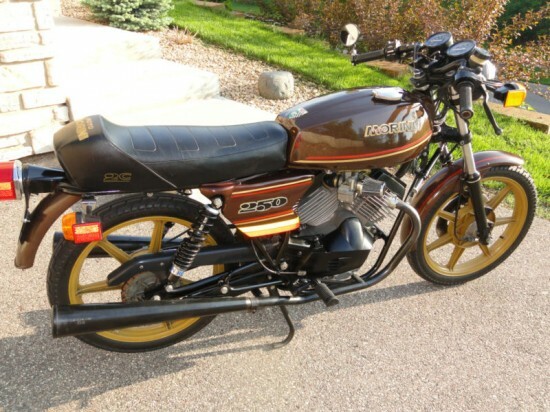 The seller appears pretty knowledgeable about the the bike, and a quick internet search turns up very little information about the 250cc version of the bike. It looks like parts availability shouldn’t be too much worse than for the larger bikes, which is to say “not great”. But the price of entry should ultimately be low for such an exotic and usable bike, and you’ll certainly never see another at your local, or pretty much any other bike night. 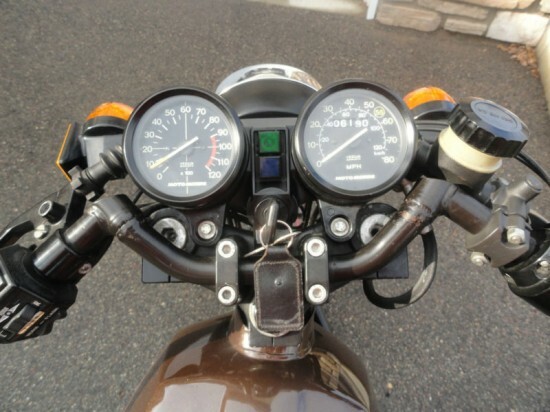 Not overhead cam – they are overhead valve with pushrods. The belt is a short item that drives the single cam which is nestled right in the crook of the Vee between the cylinders.